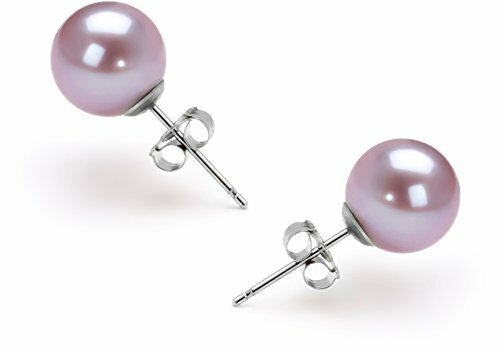 Turn up the volume in your jewelry box when you bring these fabulous lavender cultured pearl earrings to the party! Take good care of them by keeping them separate from your other jewelry to prevent scratches and dings. This earring set showcases 7 to 8mm lavender freshwater cultured pearls and is an overall AAAA quality - combining amazing mirror-like AAAA luster, perfect (and very rare) AAAA shape and AAAA body. Your earring set will be carefully packed and shipped to you in an elegant jewelry box and accompanied by lots of free extras. And, if you choose, we would be delighted to gift wrap your earring set and turn this earring set into an unforgettable gift. The cultured pearl color that you receive may vary slightly from that shown in the picture. Cultured pearls are playful with light, and depending on the light conditions you view them at, they will present a slightly different color - a fascinating phenomenon. We invite you to look at your cultured pearls in bright sunlight, on a cloudy day and inside your home. The change of color you will see will surprise and amaze you. We hope you enjoy the natures beauty and its unique color spectrum that cultured pearls offer. Included FREE with your cultured pearls earring set is an Appraisal Certificate prepared by a Pearl Expert describing in detail your earring set size, color and body shape. A color picture of your earring set is shown on each certificate to ensure carefree insurance claims should those ever arise. It is a wonderful keepsake that shows you truly care. Create a WOW! Experience with a FREE matching gift box. Our boxes are exclusively designed for PearlsOnly to gently hold your cultured pearl earring set during shipping and also to be breathtaking when your cultured pearl earring set is unwrapped and opened. With a focus on detail and elegance, the overall packaging from outside wrapping to inside, creates an unforgettable opening experience. Easily care for your cultured pearls earring set, with a FREE silky storage pouch to protect your cultured pearls earring set when you are not wearing it. Although cultured pearls are very easy to take care off, we do include a FREE Pearl Care Card, so that you can easily know how to best take care of your cultured pearls earring set to keeps its value and beauty. We want you to be 100% satisfied with your purchase and that is why we offer 30-day returns on all of your purchases. Returns are easy and should you need to return or exchange an item, our customer care team is ready to assist you around the clock. And with a huge selection of Freshwater Cultured Pearls, Japanese Akoya Cultured Pearls, Saltwater Cultured Pearls, Tahitian Cultured Pearls and South Sea Cultured Pearls you can find so many things to suit your taste. If you have any questions about this product by PearlsOnly, contact us by completing and submitting the form below. If you are looking for a specif part number, please include it with your message.